The MLi Support Action will deliver the strategic vision and operational specifications needed for building the European MultiLingual data & services Infrastructure, formulate a multiannual plan for its development and deployment, and further the multi-stakeholders alliances ensuring its long term sustainability. These outputs, arising directly from widely-recognized LT experts and backed by consensus among research, commercial and professional stakeholder communities, should help decision makers and sponsors at EU and Member State levels to support the deployment of the infrastructure and its various multi-lingual components. 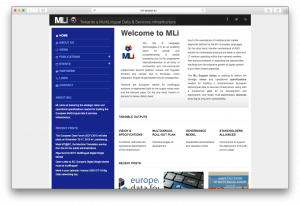 For more information please visit www.mli-project.eu. This project has received funding from the European Union’s Seventh Framework Programme for research, technological development and demonstration under grant agreement no. 610951.